Waterproof touch pop-up TV for installing in your bathrooms, SPA, outdoors or anywhere else where water might be a hazard. With a completely waterproof faceplate, all you need to do is installing this waterproof device so that you are free to enjoy in the water, and connect it to our waterproof DVD player using only one waterproof romote controller. We believe this device will bring taste, elegance and fascination on your life. 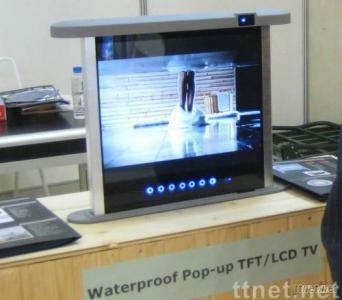 Take your entertainment to places you never thought possible with this luxury waterproof touch pop-up TV player. Features: - Tatally waterproof and moistureproof. - High quality with vivid video showing effect. - 2-in-1 remote controller. (connect to our DVD) - High stability and security to ensure the system run trouble-free for long time.